February was an interesting month to say the least. I went back to work, told my family and friends about my blog (! ), and opened up my home to family. I didn't focus on blogging as much as I should have and that's something I've been working on for the past week. I keep beating myself up because I know I should have done better this month and I've thrown out any progress I've made so far. I still got a long way to go before I'm back on track and I think setting goals is the best way to do it. 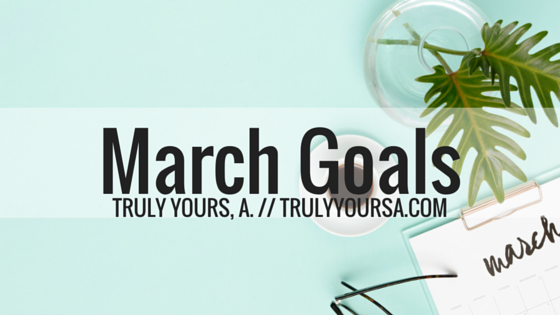 Keep reading for my progress on my February goals and ONE goal I want to accomplish for March. 1. Work with a local blogger. - Semi-completed: I didn't fully collaborate with another blogger, but I did reach out to a fellow RVA blogger that I've been following and admiring for a while. 2. Send 1 newsletter by the end of the month. - Not completed: I promise I worked on creating a newsletter, but the look just wasn't what I wanted. The perfectionist in me just wants this to be perfect before I send it out. Maybe next month? 3. Answer all comments in a timely manner. - Semi-completed: I did answer a few comments on the blog and Instagram, but not as many as I should have. Like I said last month, I want to try to answer comments as they come in. For the month of March it's back to basics. I need to get back on track as far as planning content, writing, taking pictures, and answering comments. I'm only going to give myself 1 goal for this month so I can really focus and hopefully everything else will fall into line. 1. Continue posting on a consistent basis. - I fell off (again -.-) with posting on Mondays, Wednesdays, and Fridays. Three days a week isn't much, but I've failed at making it happen. I realize that I may need to rethink my schedule so for the rest of the month I'll be posting two days a week - Monday and Thursday. I also have a few mini-goals that I won't mention here, but I'm hoping that they will help me focus and get back on track. I really think consistent posting is the cornerstone of blogging; once I've gotten that down I can accomplish anything.